Is the Maxi-Cosi Zelia 5-in-1 a good baby travel system for your family? Read our 2019 review to find out. 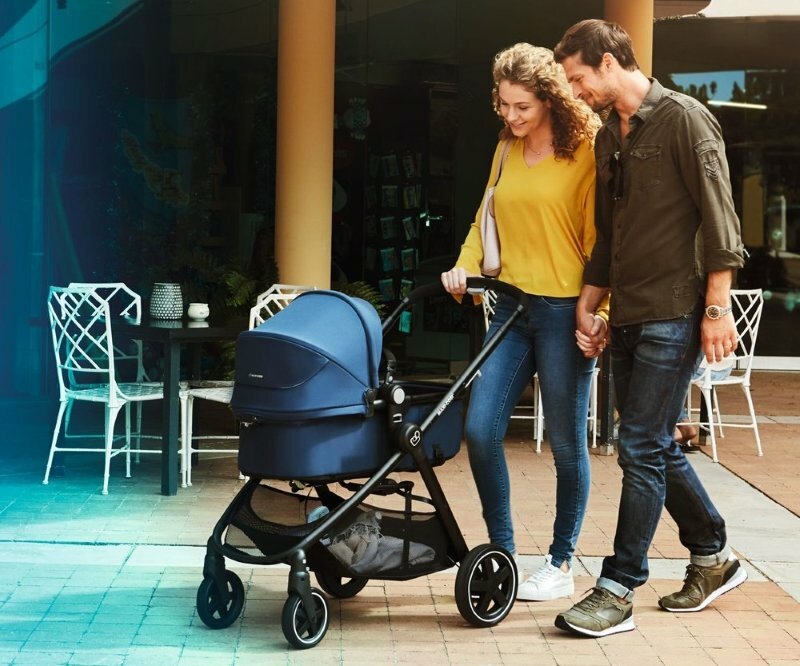 The Maxi-Cosi Zelia 5-in-1 is a modular 4-wheeled travel system that’s extremely versatile in how it can be used. 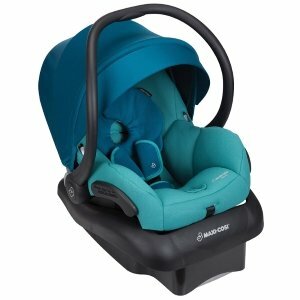 It features the Mico 30 car seat and comes in 4 fashionable colors: emerald tide (bright blue), adventurine blue (grayish blue), night black, and violet caspia. Travel systems can save you money in the long run, especially if you find them on sale. As far as price goes, this one isn’t too outrageous, considering all of its perks. It’s best suited for urban living, so if you’re looking for something to handle hiking trails, you should probably look elsewhere. 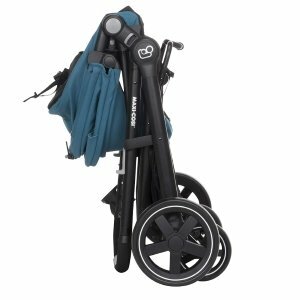 Otherwise, this sleek and stylish travel system will suit your needs for walks through the city or the suburbs. No tools are required when you unbox and assemble this system. Every part just snaps together with no fuss. The padded handlebar on the stroller is height-adjustable, so mom and dad or big brother can easily push the baby along. The stroller needs adapters for using with the car seat, but they ARE included in the box. Parents really love the versatility of this system. Both the carriage and stroller seat modes can be used with the child facing the parent or forward-facing. Parents also appreciated the large storage basket, with enough room to hold items from a small shopping trip or a day out at the zoo, etc. This is a tiny gripe, but there are only 4 colors offered for the travel system, but if you buy the seat separately, you can choose from 10 colors, including a white base on one of them. What are the child size limits of the Maxi-Cosi Zelia 5-in-1? With the infant insert and thick padding, this seat is great for preemies. While the plush padding might feel a bit snug at the top for bigger babies, it should still fit well enough to last until they reach the weight or height limit. The Zelia stroller’s maximum weight is 50 pounds. So this system should last you through most of toddlerhood. The 30 pound weight limit of the car seat isn’t that generous by today’s standards where more car seats are in the 40 – 50 pound range to allow longer extended rear-facing. 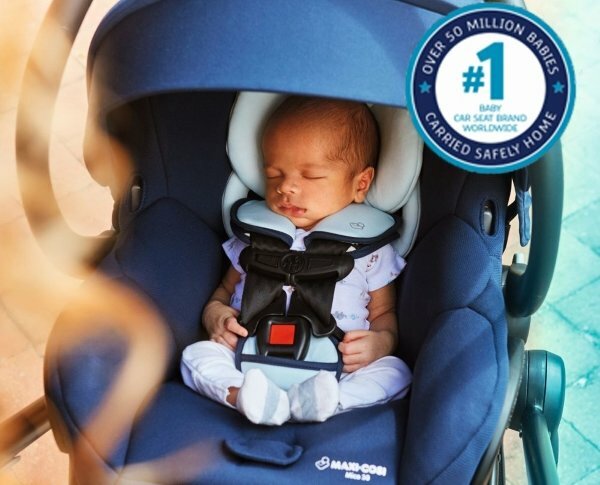 But compared to it’s cousin, the Maxi-Cosi Mico AP with a weight limit of 22 pounds, the Mico 30 should allow your child to ride rear-facing past the bare minimum of 2 years old. As far as fit goes, if your child is really tall for his or her age, you may find the shoulder straps on the stroller harness to be too low before they reach the weight limit. 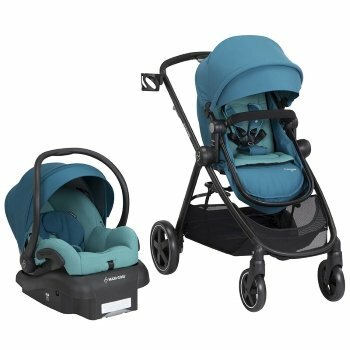 How big is the Maxi-Cosi Zelia 5-in-1 travel system & will it fit in your vehicle? This car seat is light! Anything under 10 pounds makes a big difference when using as a baby carrier. It’s a bit long from front to back, but the width is not too bad, allowing for a 3-across configuration. For most mid-sized vehicles, this should fit. However, ALWAYS compare the dimensions to your back seat before you buy to ensure you’ll get a great fit. Surprisingly, some parents think the stroller is too lightweight, so much so that it feels flimsy and can move around when putting the baby in it. For cars with a very small trunk or boot, the stroller will take up a lot of space. It should fit fine in the cargo space of midsize and large vehicles however. 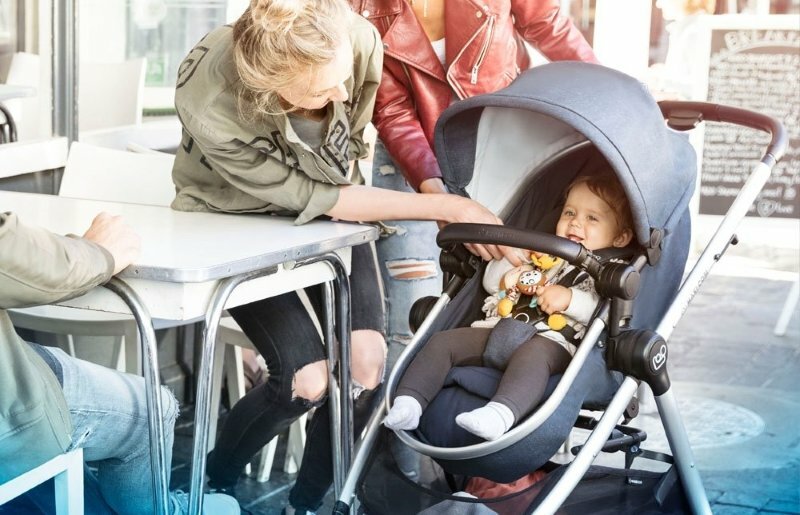 How safe is the Maxi-Cosi Zelia 5-in-1 travel system? There are several safety features to love about this system. First is an easy toe-tap lock on the rear right wheel. Plus, the front swivel wheels can be locked for simple straight-forward motion. Both these features would be useful when stopped on an upward incline, for instance. The canopy on the stroller expands far enough to almost completely cover the child. It uses a zipper extender so you won’t have to worry about it falling down too far when you don’t need it. There’s also a peek-a-boo window so you can keep an eye on the little one. In bassinet mode, there’s an apron cover that snaps on the feet end of the bassinet to keep baby warm and cozy. Combined with the canopy, it’s easy to keep her protected from the elements. You may find the strap covers on the car seat harness to be too bulky for newborns, which makes it difficult to position the chest clip. You CAN remove them, however, which is stated (pg. 30) in the instruction manual in one small section you may not notice. For the car seat, the biggest complaint was not being able to get the seat to the proper angle. Some parents thought their babies’ heads slumped too much and/or couldn’t get the straps tight enough for newborns. With no level indicator on the base, we can understand how that might be frustrating. How easy is the Maxi-Cosi Zelia 5-in-1 to install and use? Everything can be adjusted with just a push of a button and a click. No tools are ever necessary. The hardest adjustment will be the lack of a no-rethread harness in the car seat. It’ll take more time to change the straps to new slots, BUT that makes it easier to tighten and allows you to replace the harness if needed without replacing the whole seat. There’s also no lockoff device and no recline angle indicator on the base. Only the American belt routing method can be used for installing without the base, so you’ll need to know how to do that if you’re going to use it in a taxi or airplane. Thankfully, LATCH installation is a breeze with simple push-on lower LATCH connectors. While there’s an anti-rebound bar on the base, there’s no level indicator. You’ll choose from 3 recline positions on the base, but must use a red level line on the car seat to determine if the seat is level. The stroller seat can be used as both a regular toddler seat or a bassinet. Both of those can be used either forward or parent-facing. To recline the seat, you will need two hands, so remember to engage the rear brake first. A one-handed recline would be more convenient. But the recline allows for lying flat, a simple rest or sitting totally upright in both parent and forward-facing positions. Folding the stroller up is super easy, not quite a one-hand fold, but it’s designed to keep you from bending over. Plus, it’s freestanding and light enough to haul in and out of the car without breaking your back. Accessories are pretty lacking in this system. There’s only one parent cup holder on the stroller and no child tray. A few parents were disappointed in this, since other strollers often have two cup holders, a compartment for phone/keys, and a child tray. One of the biggest gripes, and it’s not really a huge problem, was having to install two small adapters on the stroller in order to attach the car seat to it. To do this, you have to remove the stroller seat first. The adapters attach right on the stroller frame in just a couple clicks, no tools necessary. The main annoyance is making sure you have those adapters on hand if you need to change it out from car seat carrier to regular stroller mode. Removing the car seat requires two hands, so that’s also a bit of a pain. Note: The stroller must be in the forward-facing position in order to fold it up into one piece. A padded cushion that slips over the carry handle of the car seat to make carrying the baby more comfortable. It’s self-wicking and easy to position wherever you need it. While not cheap, there’s a lot of value for the money with this travel system. Ease of use is one big bonus, with easy push-button and click adjustments. As a whole, the system works great. Most parents are happy with it. Overall, it’s lacking in non-essential things that would have made this system almost perfect, such as one-handed folding and an extra cup/key holder and child tray. If you’re looking for comfort, versatility, and a lightweight system that’s easy to assemble and adjust, the Zelia 5-in-1 is a great option. If you really want a lot more convenience features, it’s probably not the best choice. ❮ Find out if the Hamax Caress in frame mount or rear mount styles is the best bike seat for your family in our 2019 review.